Potty training a puppy in an apartment isn't the easiest thing you can do. When you have to potty train your dog in a house with a yard, it's so much easier. The hard thing about potty training your dog in an apartment has to do with the fact that you really need to think of alternatives aside from letting your dog outside, and this is the perfect guide to help you for just that! Sure, you could use the outdoors as a variable in potty training your dog, but we're also going to go over some of the other best options out there! Baby gates are one of the very best options for you to have when you're potty training your puppy in an apartment. The main reason for this, of course, is to limit your dog's accessibility to certain areas of the apartment such as the kitchen. Every house/apartment has rooms that dogs are more prone to go to the bathroom in, and some of the biggest rooms that dogs like to go to the bathroom in are the rooms that they pee and eat in. If you can prohibit your dog from accessing these areas very often, then you can greatly limit the amount of accidents in the house, and this is exactly why baby gates are one of the very best options for you to choose from when you're potty training your puppy in an apartment (or anywhere for that matter). Puppies aren't very good at holding their bladder. They're typically going to need to go pee every hour, and if not, they're going to need to go often! You shouldn't punish and scold your dog if he/she goes to the bathroom in the house a few times because when you're training, it's natural for that to happen sometimes. When you were a baby, didn't you go in your pants sometimes? The less hard you are on your dog, the better off the training should be with him/her. Make sure that you're very patient and teach the correct way every time! Dogs react better to positive reinforcement than they do negative reinforcement, remember that! It's going to happen. You're going to be cooking dinner and look over and see your dog take a squat. When you see this happen, don't run over and scream at the dog, but try your best to clap at the dog and say "No!" This can really help you out, because if you punish the dog in any cruel way you're not going to be able to train him/her correctly. You should take your dog outside as soon as possible once you've stopped your dog from peeing mid-stream (or taking a number two). You should then try your best to persuade the dog to go outside, and as soon as he/she does make sure you let them know that they're good for doing so! Treats are very effective at this point in their training, and before long they'll want to go to the bathroom outside (or wherever you want them to go). Believe it or not, there are other options out there rather than letting your dog outside every time to let him/her go to the bathroom! I'm not telling you to always use the alternate methods, but if they work out better for you then there's no reason for you not to try them out! It's very easy to clean up, simply throw the pads away (rather than having to walk outside and scoop up the poop. Your dog won't get as dirty. Dogs always end up getting dirty when they go outside to use the bathroom. They come back in with mud all over themselves and look like they just wrestled a pig, by using this method you won't have to deal with this anymore! It's not too expensive. Obviously letting your dog outside is the cheapest method, but this method truly isn't going to cost you much. If you can train your dog to always go on these pads, then you'll only have to pay a fee for the pads here and there. You might not want to use this method for your dog's entire life, but if you decide to try this out then you might even choose to make that a reality! If not, using doggy pads is one of the very best ways for you to get your dog started at least. 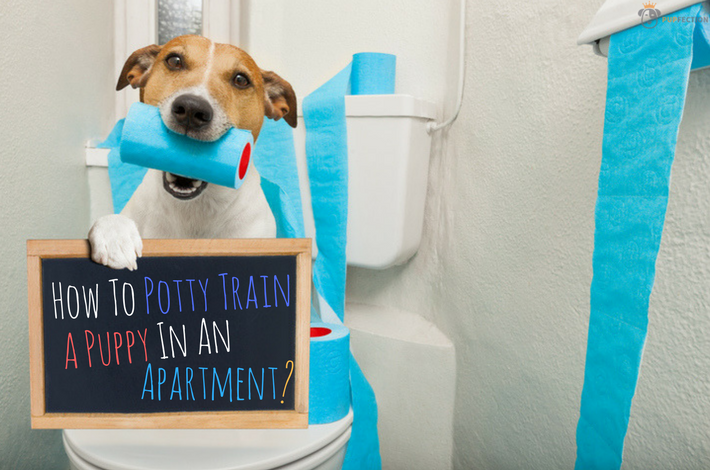 Potty training your puppy in an apartment just became a whole lot easier. Another branch off of this method that could even be cheaper is for you to use reusable training pads. The reusable ones will save you a ton of money in the long run, and even though it's kind of gross you could really benefit from this method! Litter Box – Yeah, I know what you're thinking. "Litter boxes are for cats! Not dogs!" However, I'd argue that you're wrong. They make and sell litter box versions that are designed specifically for dogs, and they work like a charm. Cheap. A one-time fee of buying a litter box paired with the fees here and there for the litter to put in the box is all you're going to be spending. Sure, it's not the cheapest option on our list, but it's definitely something you should consider! Keeps your dog clean. As stated above with the doggy pads, you can expect your dog to stay clean by using this method rather than going outside all of the time. Your dog won't be stepping in mud when he's in the litter box, and this alone is one of the greatest benefits of all. It's kind of funny, when you have people over you can let them know about how you trained your dog to use a litter box! It's also not as hard as you'd think training them via this method. One issue you should really keep in mind though is that if your dog is big, then he/she might have a lot of issues using a litter box. The litter box idea is generally meant for small dogs that are meant to live in apartments. Once again, you don't have to always use this method for when your dog wants to go to the bathroom, but this is a great way to train your dog not to go inside! Dog Toilets – Okay, now we're really stretching for ideas. The toilets that they make for dogs are largely expensive, and aren't exactly as practical as some other methods, but believe it or not, they work! This method is honestly the most fun to think about. Imagine your dog taking a squat on the toilet in the bathroom. If you have money to burn, then this is the method for you! Doesn't make your dog messy. It's just as clean as when you and I use the restroom, and there will be no more mud tracks in your home. The toilet system can be used for dogs of all sizes! You could have a small, big, or middle sized dog using this method and still get the same efficiency out of it. This really wouldn't be the best potty training method for a puppy in an apartment, but it's something you can consider, plus if you're rich then this could be the best overall method for you to choose, plus it's something impressive to teach your dog how to do! Dogs are always different, and a dog raised in a house versus a dog being raised in an apartment is going to attract a lot of variation. When you raise a dog in your apartment and train it to go to the bathroom via one of our alternative methods, then your dog will slowly get used to it! Whereas, if you let your dog go to the bathroom outside for years, then you suddenly move to an apartment and try to train him/her to go in a doggy toilet system, you're going to run into issues. Dogs are like humans, they won't suddenly adapt to something if things change. Your dog will not like change if you suddenly make him/her use the bathroom in a different way. One of the biggest things you need to consider if your dog goes inside is to "clean up stains and accidents immediately with an enzymatic cleaner. Dogs prefer to "re-mark" the same spots, and only an enzymatic cleaner actually breaks down the attracting, odor-causing compounds found in urine." This is absolutely crucial if you want to set a habit in your household that your dog won't break. You might be thinking about going with option 1 – doggy pads. When you're potty training your puppy in an apartment, it's important to understand that doggy pads are some of the very best tools you can use to set a precedent in your home with your pets. Rather than taking your dog outside on a consistent basis (and going through all of the floors to get there), you could simply lay down some pads and let your puppy go there! It's one of the cheapest brands you can get. You can even buy in bulk and get even further price drops by using coupons if you choose to! Cheaper isn't always better, but in this case, it really is when you compare it to the quality of some other similar brands. It's one of my favorite as well and with over 3000 reviews. I think this alone should let you know that they work. The size is perfect. It's not going to take up your whole kitchen (which should be the room of choice for you to lay these in), and they're big enough to pick up all of the droppings left by your puppy. You don't need to worry about pee leaking through. You can just crumple these up and throw them away and won't get your hands covered in puppy pee. For these reasons alone, you should consider using this option, with this product to get the best potty training for your puppy in an apartment. Check out this video to get a grasp of how to use the pads! These are highly compatible with the above-mentioned pads that you can buy for your dog. You can just lay the pads inside of the litter box, and there you go! It makes cleaning up so much easier in the long run. It's actually cross-compatible with cats. If, for whatever reason, you want your dog and cat to both use the same litter box, then you can easily rig the setup to where it works for both. All you have to do is train them both to use the litter box, and it works like a charm! It's so much cheaper in the long run than any other method. You have zero recurring fees. You can simply use this forever, and your dog will soon be highly trained and able to use this for a lifetime. The only bad part that people have run into issues with is the small size of most of these puppy litter boxes. If you have a puppy in your apartment that's going to grow up to become a big dog (which I'd advise against, not a good idea to have a big dog in your apartment), then you should beware of this method of letting your dog use the restroom and you should think about using another method. This leaves us to the next (most expensive) method. Obviously, you're going to need some good startup capital for this method, but if you think that the saying, "Go big or go home" applies to you, then you should give it a shot – because it's truly the best method on our list! If you're looking to buy one of these with a lot of money, then you should be looking elsewhere, away from Amazon! You won't find a dog toilet worthwhile being sold on Amazon, and besides, you'll need it to be installed anyways by a plumber. They resemble what the outside is like when they go to the bathroom. Having your dog switch from a house and using the outdoors to go to the bathroom is kinda similar to using one of these insides of an apartment. They're somewhat expensive, but they're a lot cheaper than a real toilet! Let's be honest, most people can't afford a real toilet for their dog to go to the bathroom in, especially when cheaper methods exist. These products will help out your dog a lot by aiding him/her in the right direction. Let me tell you why. When your dog pees on something, he/she marks their territory, and will more than likely go back to the same scent that they peed on before. Once your dog goes to the bathroom on one of these, then it won't be too hard to get them to continue to use it over and over again. You can easily wash these off, making it a semi-natural way for your dog to go to the bathroom inside the house. The bottom line for you to remember is that you should always try to let your dog go outside whenever you can. We understand that you can't always let your dog go outside when you're living in an apartment (especially on a higher floor), but if you can even find the time to let your dog outside once a day, you'll help a lot with your dog's general well-being and make his/her day! You should honestly look to buy an indoor dog (bred specifically to live inside) if you're going to be using one of these ways to potty train your puppy in an apartment, but if you can't then you're going to have to deal with the issues that run along with it. Like stated earlier, every dog is different and different ways to potty train your dog might work with different breeds other than your own, but that doesn't mean you should give up! Let Your Dog Out – This should be your first thing you should try to do when you're training your dog. The outdoors is honestly the best place for you to let your dog out, which is why everyone does it. If you can't do this due to living in an apartment, then try the next. Dog Pads – The training pads you can buy that were discussed earlier are some of the best things you can use to train your dog to use the bathroom inside. Would you rather have your dog poop on a pad or the floor? If this doesn't work, then you can use the dog pads with the method below. Litter Box – As stated earlier, the litter box isn't your first thing you should try, but you can put the training pads inside the litter box and kill two birds with one stone. Being the third method, you shouldn't prefer this over the first two, but the method works quite often! Fake Grass Toilet – This method won't always trick your dog into using the bathroom on it, but oftentimes using the fake grass toilet is a great way for you to get your dog to go to the bathroom while inside of your apartment. Overall, if none of these methods work then you can easily search for other ways you can potty train your puppy in an apartment, but these should truly be enough for you to get the most out of your money! This article looks good,I am a lot happier now than then with the hope of getting the best result out of potty …..my puppies. I am glad it helped! Will surely write on more relevant topics.